I tried this when I had the Black & White Burger when transiting through Shanghai a week or so ago. 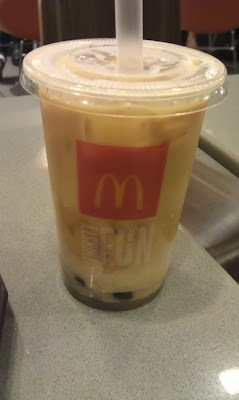 Sadly, I wasn't able to substitute the Coke in the combo for this bubble tea, so I needed to pay an extra 10Y for me to be able to try it, though not a terrible loss, I was pretty thirsty. I actually saw this being promoted when I transited Shanghai through a few days earlier, but as I was there during breakfast hours I wasn't able to try it. (Also, I don't think a Bubble Tea and Hotdog would have gone well together at 8am anyway). This wasn't a McCafe item, but a regular menu item, so I could review it. I talked about the branch previously, and I will say it again, this IFC Mall branch was one of the nicest I've been to in Mainland China. The only problem I encountered was though the man who took my order could understand basic English, when I asked him what the two different Bubble Tea flavours were (one was 10Y, and one was 11Y) he just gave me a blank stare back. Both looked similar in the photo with the more expensive one having coloured balls, so I just went with the cheaper one, as I'm sure my Black Burger had enough food colouring to last me for a month. When I recieved it, it looked a little too white for my liking. I feared that I would only taste sweetened condensed milk, rather than the tea, but to my surprise it was made with proper milk, and wasn't overly sweet. The tea was a little weak, but it was acceptable. If I didn't have the Coke Zero with my meal, I would have easily finished it. The tapioca pearls were soft and tasted like they were somewhat fresh. They were softer and tastier than the ones we ever had in Canada, but the ones in Taiwan (and even the one I've had here in Singapore) were better than those. Maybe someone could help me out and tell me the difference between the two. If you could taste the tea a little more, it would be a 4. I've only had McD's in Indonesia once! Though now that I live in Singapore, Batam Island is pretty close and I've been meaning to go make a trip over. Indonesia seems to have some pretty cool promo items, so hopefully I'll be able to try more. Wish the poster were a little bigger, can't really see the text. But from the looks of it, could it be slightly more expensive because it has colourful pear;ls/bubble/boba?